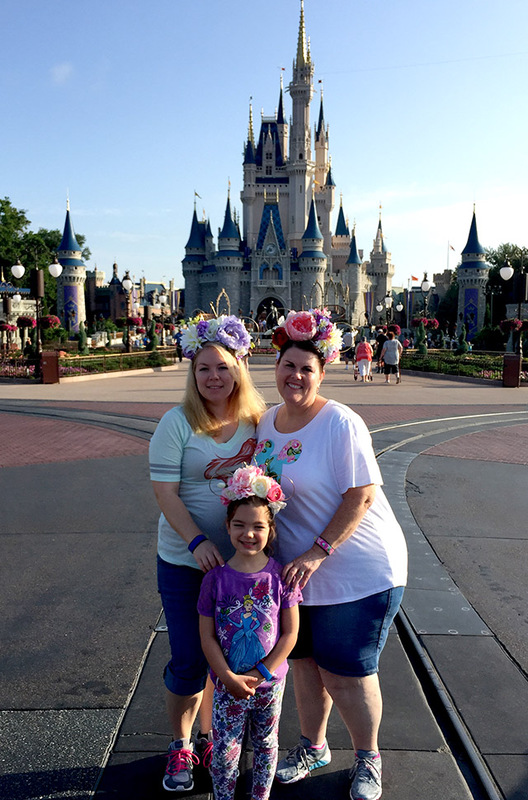 Walt Disney World hosted our multigenerational family for #DisneyGrandAdveneture; opinions expressed are my own. 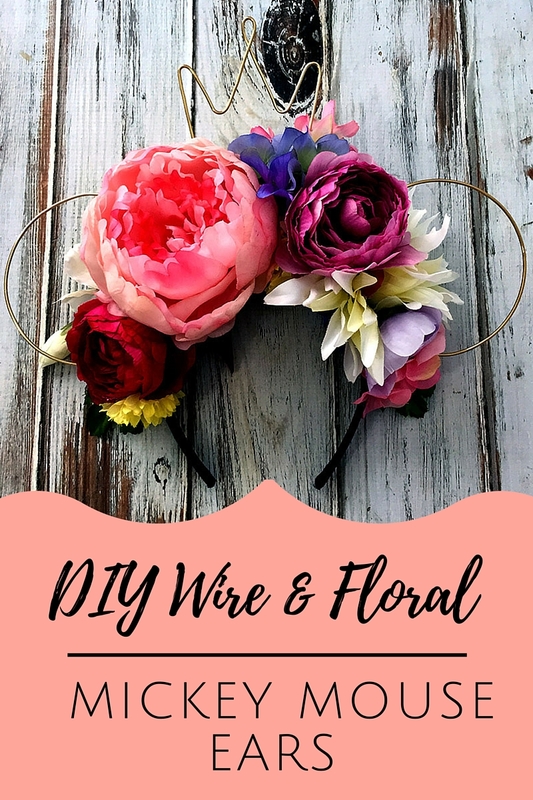 DIY Wire & Floral Mickey Mouse Ears This post contains affiliate links, which may earn me a small commission. I have never really wanted Mickey Mouse Ears ever. Not that they are not cute and all, but the hats look stupid on me and the headbands hurt my head. 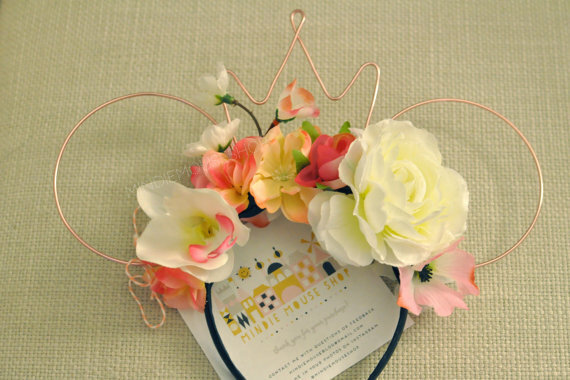 Well when I was perusing Instagram I came across Wire & Floral Mickey Mouse Ears and I fell in love with them. Most of all I knew I could DIY them myself! So off the Youtube I went. I found a couple of videos on how to make these darling Mickey Mouse ears. This one by Jessica Journey was by far the most informational. The video is about twenty minuets long and well worth watching. Her ears are adorable and she gives you all the steps and information you need to make your own ears. I also went to Etsy to look for more styles and most of all to check out the pricing. Well this cheap-o grandma wanted 3 pairs. One for me, one for my daughter and one for my granddaughter. The lease expensive pair I found was $20.00. Ya I can make them myself. What else I found were a few fantastic shops that had beautiful ears which gave me my inspiration. When I went back and looked at my favorite Etsy designer Mindie Mouse Shop I saw these ears. They have a crown. I loved these even more, and I knew I could make these too. I made mine a little different than what is shown in the video. Instead of wrapping the wire around the headband itself I made one bend, hot glued it to the head band and wrapped it with coordinating ribbon. 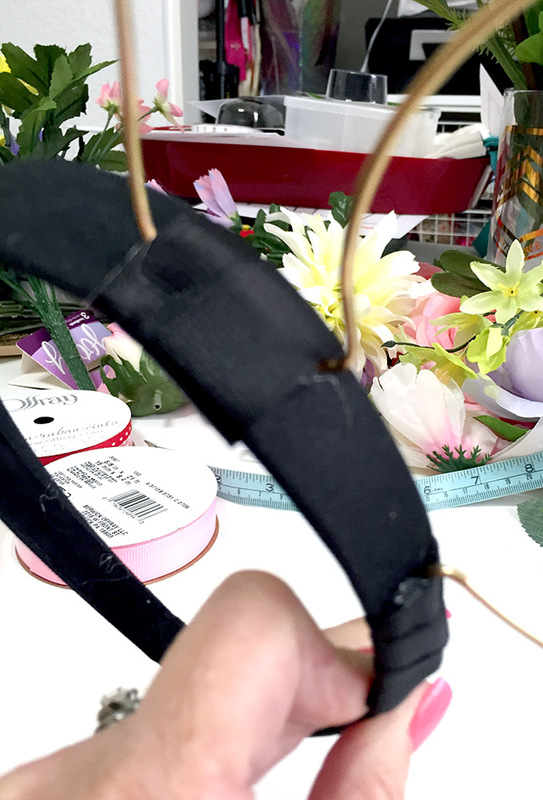 I then just used my hot glue gun to attach the flowers to the headband. Its all pretty easy! Here are all three pairs. My daughter wanted purple, grand daughter pink, and I wanted a pretty spring mix. And here we are wearing them at the Magic Kingdom! And then Tinker Bell showed up! 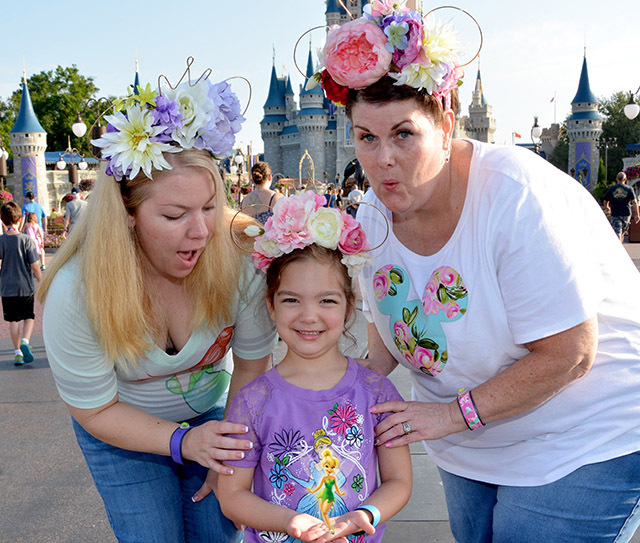 I think Tink wanted her own pair of DY Wire & Floral Mickey Mouse Ears. If your looking for silk flowers here are a few I found, they will work perfectly for your ears. Here are a few wire choices, I used gold but I am loving the light copper color, it looks like rose gold to me! I looked all over this past year for ears to wear at Epcot International Flower & Garden Festival- I'm pinning this for next year! Thanks!! Hi, I love the ears, however is there a template on DYI on how to make the wire crown? Is there a template you used? Is there a template that you would recommend? I did not use a template for the crown the wire is so flexible I just kept working with it until I liked the way the crown looked. HTH! How long should the ribbon for the blue bow be? Lily, I did not use blue ribbon for my ears. These are gorgeous!!! My family and I are going to disneyland in two weeks and I would love to make these! What kind of wire did you use? I found the wire in the floral section at both Joanns and Walmart. I apologize I don't know the name of it. 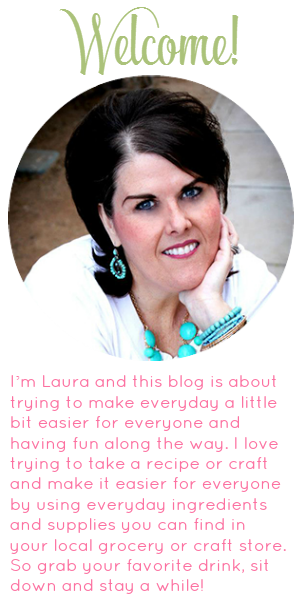 I tried to get the instructions from the site but she is taking a break. I make the regular ears but my daughter wants the wire ones. Do you have the instructions. Yours turned out beautiful. I used the video and made a few changes for my ears. 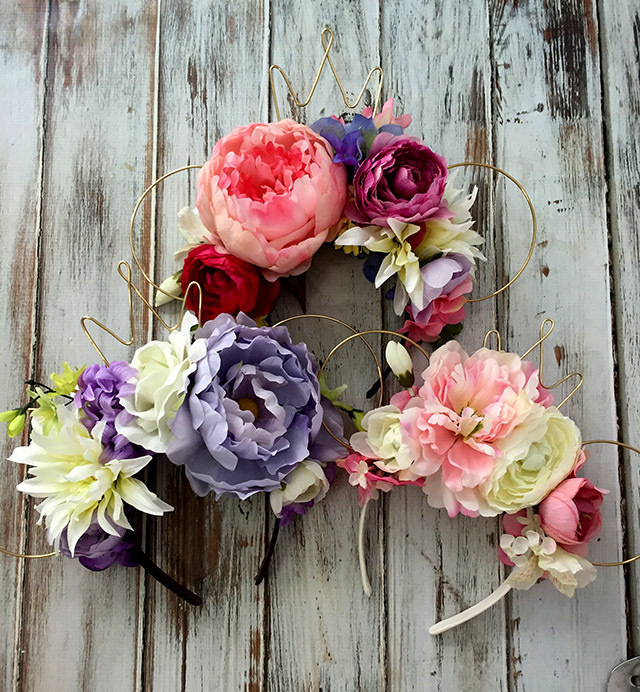 There are a lot of other Etsy shops that offer the wire and floral ears. how did you make the crown i have been trying to find a tutorial but seem to not find one. do you have any tips or tricks to bend the wire in the shape of the crown? Paige the wire is so easily bendable I just shaped it how I wanted it to look. Thank you for the great tutorial! I plan on making these for a bunch of family members for our upcoming Disneyland trip! I do have a question for you. 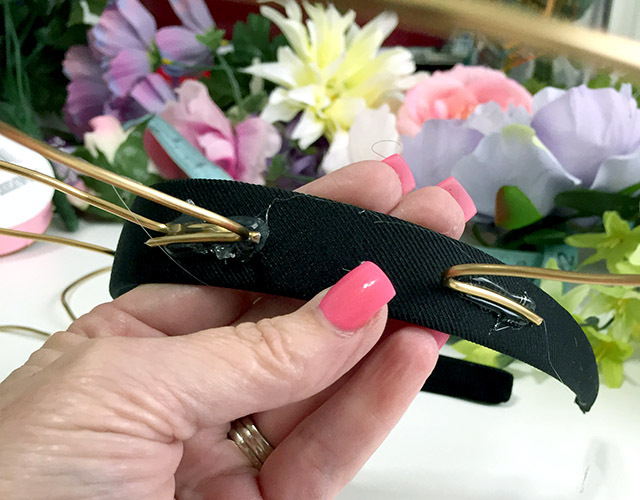 I had seen the video tutorial you linked to and had planned to wrap the wire around the headband like she does, but then I found your tutorial, and now I'm liking the idea of just bending and hot gluing as you've done. My only fear is that in the very hot summer heat, the hot glue might start to get soft and the wire might end up moving around. Did you experience that at all with your ears? Thank you! If you wrap the wire with ribbon like I did I don't think you will have a problem. We wore ours in June and had no issues with the heat and the glue melting. You can also make sure to use a hot temperature glue stick that would stand up to the heat. Your ears are gorgeous! Did you attach the crown to the headband in the same way as the ears or are they attached in a different way? Thanks for the tutorial. Thank you so much for your kind words!Yes I did attach the crown in the same manner as the ears!